It’s been awhile since I’ve been able to call myself a “gamer” (I’ve had a stint at Counter-Strike before, with Sega Genesis, Atari & Apple IIc before that) but hey – I’ll try anything once. Especially if I’ve heard it to called a cult classic before. What’s really the big deal with this ball-rollin’-Katamari king-queen-person-thing? The premise is simple. Roll over everything and pick up everything smaller than your roll. Get larger as these smaller things stick to you and conquer all! Roll over cities, all over a tea room, towns – even pick up squid in the sea. And while I had a chance last week at a Namco Bandai event at The Mondrian Hotel on the Sunset Strip to try out a few games, Katamari Forever – the 5th installment in the Katamari series – actually had me considering a console purchase just so I could play the game. 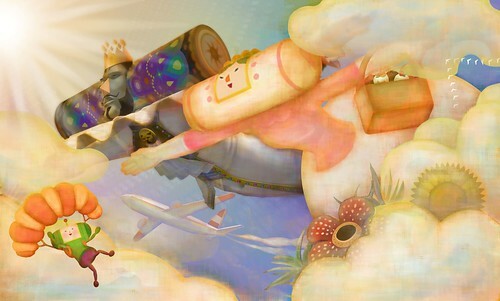 Katamari Forever – which is available only for PS3 – is released today. First of all, it’s just a beautiful game. One of the new features in …Forever is comic book-styled graphics. Not only is the the game at its highest resolution – in 1080p High-DefÂ – it took that technology and put an artful means to it. This is one of those games where your friends aren’t fighting you over the controller because they’re having almost just as good of a time watching you play. The landscapes and environs your character, a “cousin,” gets to roll over with his/her Katamari is just too fun. Another new feature is the “Prince Hop,” which with the Sony SIXAXIS controller, you get to jump your Katamari with a flick.